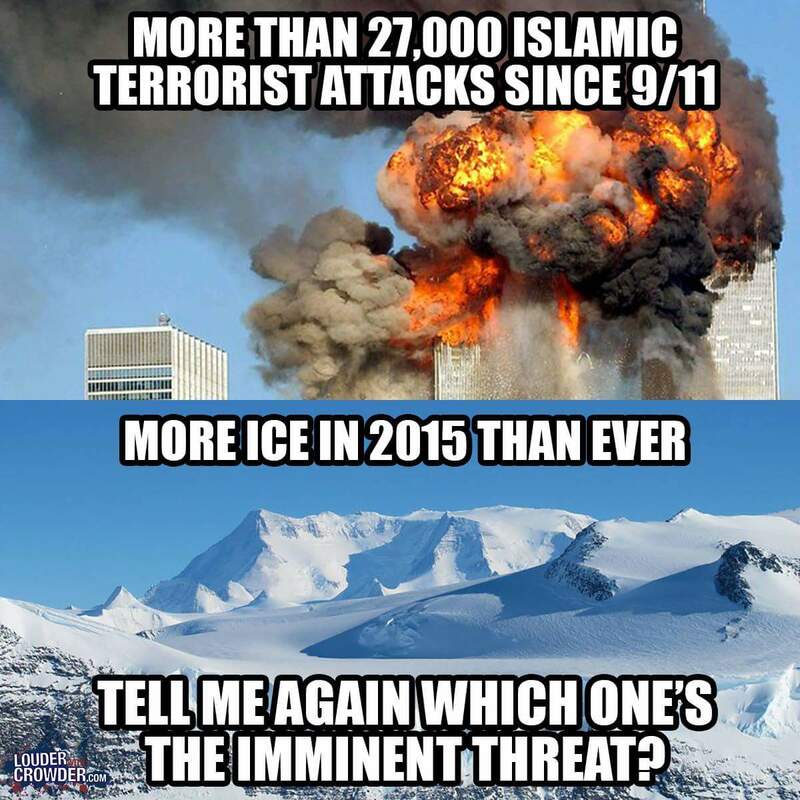 Tell me again which one is the imminent threat? This tweet by Steven Crowder seems to be the original source. Well, I know that the second statement is wrong (Also brought up on Skeptics.SE before), but would like to know if the first statement is true or not. The source for this number is likely thereligionofpeace.com, not a scholarly site. Far-right websites such as Breitbart are using it as a source for similar claims (the number is changing daily, and the 27000 figure is a bit older). [...] we are not making the claim that this is a scientific product. We only include incidents of deadly violence that are reasonably determined to have been committed out of religious duty - as interpreted by the perpetrator. Islam needs to be a motive, but it need not be the only factor. We also hope that this list offers moral perspective against so-called "Islamophobia" and other complaints from Muslim identity groups that are petty by comparison. Their list contains a vague description of each event, but no sources. They say that they provide sources upon request. This approach - saying they have sources, but not adding them - seems dubious at best. Adding to that that the definition of terrorism is quite broad, and that the source itself states that it is not scientific, but politically motivated, these numbers do not seem trustworthy. The above should show that the 27000 figure is dubious. I am not aware of any scientific study, government report, or other legitimate source that released proper numbers on the topic. The GTD would be a credible source. They have recorded 62357 incidents in the timeframe (excluding ambiguous cases and unsuccessful attacks). They do not allow filtering by religious motivation, but taking the top 7 (selected by me) islamic terrorist groups - Al-Shabaab, Tehrik-e Taliban Pakistan, Hezbollah, Boko Haram, Taliban, Al-Qaeda, ISI / ISIL, Hamas - , there were 10708 incidents in the timeframe. In comparison, the top 5 (again selected by me) non-islamic terrorist groups - Kurdistan Workers' Party (PKK), Basque Fatherland and Freedom (ETA), Lord's Resistance Army (LRA), Revolutionary Armed Forces of Colombia (FARC), Liberation Tigers of Tamil Eelam (LTTE) - were responsible for 2122 incidents (some may disagree with the classification as terrorist group for some of these groups, but the GTD at least uses well-defined criteria for their selection). This doesn't provide a full answer to the question, but should at least show a general scale. Those numbers are plausible but misleading. Islamic terrorist attacks are certainly a big threat if you live in a Middle-Eastern country with major terrorist presence (although typically not the biggest threat since these tend to be the countries which have a power vacuum due to some ongoing conflict, such as a civil war). They are a minor problem in the US, which is the political context this claim is usually made in. For a more reputable data source, you can look at the Global Terrorism Database, which is not searchable by type of terrorism, but tracks about 70.000 incidents in the given period (the number might change depending on what definition of "terrorism" you use). However, only 227 of those are within the Unites States. Here is a map of all terror attacks in 2015 (the last year that the GTD has processed); it is immediately obvious that the majority happen in a small number or conflict areas in less developed countries. The database tracks 38 terror incindents in the US in 2015. Of those, 8 are far-right attacks against muslims; 7 were islamic terrorist attacks; 5 were attacks against abortion clinics; 5 were far-right attacks against non-muslims (blacks etc); 1 attack was done by animal rights activists; 1 by anarchists; 11 attacks (mostly against churches) had no identifiable motivation (beyond, sometimes, mental illness). If you count fatalities (numbers include the perpetrators), then islamist attacks caused 25 deaths, far-right attacks 15, abortion-related attacks 3, other 1. Compare that with the number of mass shooting fatalities in 2015 (369 per the Gun Violence Archive; there is some overlap), and the results suggest that the islamic terrorist threat is about a magnitude smaller than the mass shooter threat, and about the same size as the far-right terrorist threat. 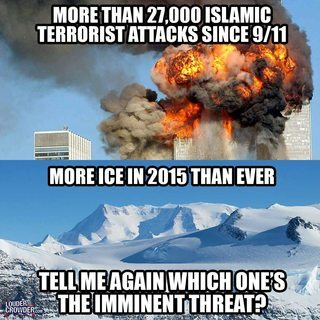 Comparing with the threat of global warming would not be possible without lots of hypotheticals so I won't even try that, but the comparisons with other violence-related threats suggest that islamic terrorism in the US, while not negligible, definitely isn't something that should top your concern list. Not the answer you're looking for? Browse other questions tagged islam terrorism . Did the Arctic Ice Sheet grow by 60% from 2012 to 2013? Have there ever been any real, credible bomb threats?